By Gabrielle. Photos & styling by Amy Christie. 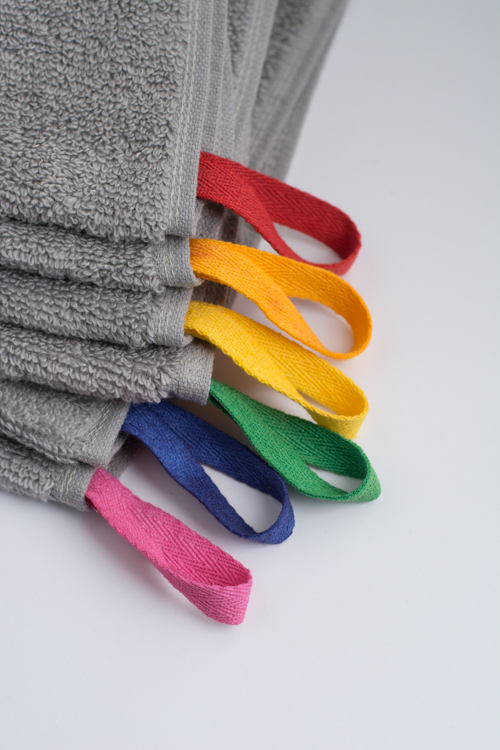 When more than one person shares a bathroom, towels become an issue. No doubt you have noticed this as well. You step out of the shower, grab a towel, and realize it’s soggy. Yuck. I do not like sharing my towel, but I get that it’s hard to keep things straight, especially if the towels are all the same color. Happily, there’s a simple solution: add a loop of ribbon — a different color for each person! Assign a color to each family member (and another color for guests!) and proceed with confidence that next time you grab a towel, you won’t be accidentally sharing it with someone else. Plus, there’s a bonus feature. 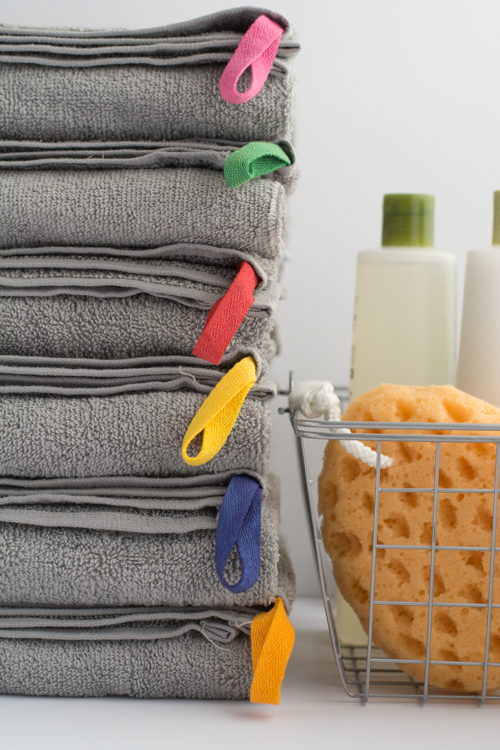 Instead of towel racks, use wall hooks in your bathroom and use the loops to hang the towels on the hooks. No more towels slipping to the floor! And hooks are space saving too. 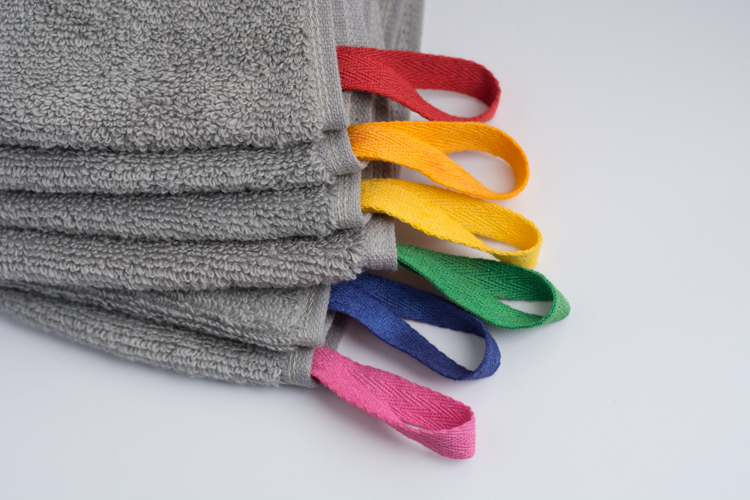 I generally gravitate toward white towels in the bathroom, but for this tutorial I chose a neutral grey that I thought would both look good in photos and contrast nicely with colorful ribbon loops. 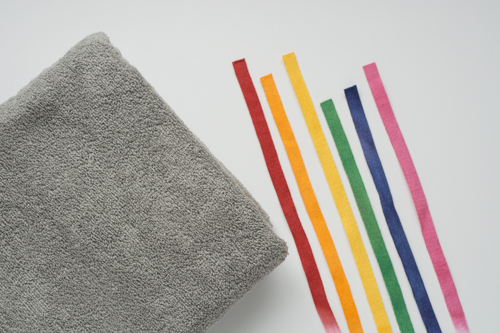 Different colors of grosgrain ribbon or cotton twill tape work wonderfully for this project, or you could go with colorful or patterned towels, and then use a neutral colored loop. The choice is up to you! Let’s get started. The towel confusion is over! Create a loop in whatever size you’d like, and cut your ribbon accordingly. The loops pictured are 6″ in length. 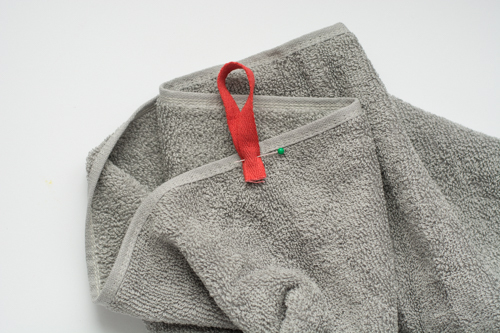 Fold the towel in half the long way. 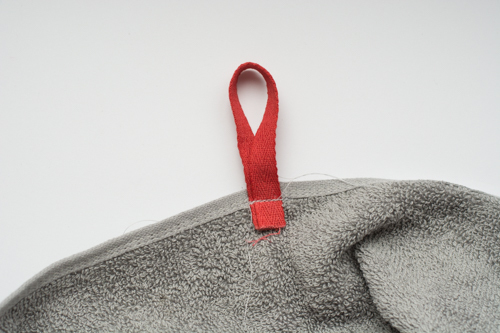 Pin the loop on the fold with the loop hanging over the edge. Sew in place either with the machine or by hand. Trim the excess threads. Make sure the attachment is good and strong. Optional: If your ribbon is fraying, apply Fray Check to the ends. Hang and use! Easy as that. This is the cutest idea, and so simple! It would be fun to have each child/person choose their own color up front. I LOVE this idea! So simple and soooo useful! I am curious — who gets which color? What a great idea! It’s so clean and festive looking. I’ve gone with different color towels – I can’t sew. love the idea! hate the thought of starting all the way at the dyeing of twill tape. i am definitely one to begin my crafting, at the shortcuts! lol. great look though. I’ve been wanting to replace my towel bars with hooks — great idea! And of course the ribbons are adorable. Where are the white knobs from? I love how this looks so much. The ribbon looks like shoelaces. Are there different kinds of grosgrain? We have white towels for our boys. I wish I had picked grey! I’m trying to get them to hang up their towels! Maybe this will do the trick!! Oh that is too funny. The coloured stick figures! Perfect and simple like everything you do. Love it! This is fab. I just bought a stack of grey towels because I was sick of all the randoms. I might just try this. Thanks! This is a great idea! I don’t like the idea of having multiple colored towels, but I wasn’t sure how to get around that with my kids. 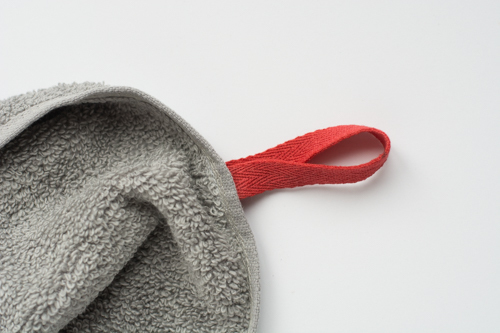 We have been using different hooks for each child, but that doesn’t always help (cough…towels on the floor…cough). Love this idea with the ribbons. That way I can look and easily identify who the “towel on the floor” child is! We did this with our towels several years ago when none of my 6 children were old enough to be able to get the towels to stay on the hooks on their own. (hooks which, of course, allowed that many towels to hang in a small area) I know don’t understand why all towels don’t automatically come with hooks. It makes so much more sense. And, we have EVERYTHING we buy for kids color-coded. That way, we always know who should be responsible for it, or when someone has something that isn’t theirs. Brilliant! Last year I got each kid their own colored towels for exactly that no-one-likes-accidentally-sharing reason! They hang theirs on hooks t00, but they’re constantly falling down…I am totally going to add the ribbon loops! Thanks. Perfect for the cottage when we have 16 pple together!!! Well, as long as they can remember what color is theirs! I ;love this!! We were colour coded as kids!! Bowls, cups, towels etc! !